As seen earlier, the current in the cable, dielectric loss and sheath loss together cause the increase in the temperature of the cable. The heat produced due to increase in temperature must be dissipated to the soil. When rate of heat generation and dissipation becomes equal then temperature becomes constant. This temperature in fact is the important factor for deciding current carrying capacity of the cable. The path for the heat dissipation is through the dielectric, then sheath, bedding, serving and finally into the surrounding soil or air. 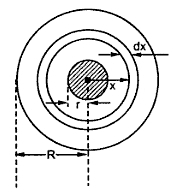 The heat flow in a 3 phase belted cable is shown in the Fig. 1(a) while heat flow due to a three single core cable to ground is shown in the Fig. 1(b). In case of three phase belted cable, the heat flows through three parallel paths and all the three conductors are at same temperature. The overall heat flow in a cable is similar to the flow of leakage current in an electric circuit ; flowing radially out from core to ground through dielectric, sheath, bedding armouring and serving. Consider the equivalent circuit for heat flow in a three phase cable as shown in the Fig. 2. The total temperature difference is difference between conductor temperature and ambient temperature. The S1, S2 and S3 are thermal resistances of the three dielectric paths which are in parallel. Then heat flows through bedding whose thermal resistance is S4. Finally it flows through serving whose thermal resistance is S5. The G represents the thermal resistance of ground to ambient temperature. The current carrying capacity of cables depends on the heat dissipation and to calculate it, it is necessary to obtain the thermal resistances of various parts through which heat flows. The value of k for the cables above 22 kV is 550 while it is 750 for pressure upto and including 22 kV. In practice it is necessary to multiply value of k by 2/3 which is obtained in the laboratory, to obtain acula value of G.